How do I install ThunderHead? You are here: Home / FAQs / How do I install ThunderHead? 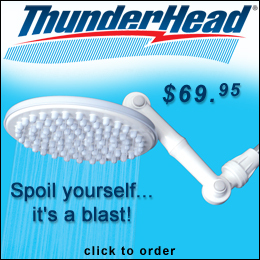 ThunderHead is a snap to install. The coupling fits into the palm of your hand and you can thread it on your shower pipe in seconds by hand – without tools. Teflon tape is provided for extra sealing.